Some people have a really hard time telling the difference between helping a patient and harming them: that’s one reason that doctors are required to take the Hippocratic Oath. And most of the time, people who are that confused by basic morality know better than to try to make a living in the healthcare industry. But an agent of chaos is more than willing to play nurse for a day if it’s his best chance to introduce a little anarchy! 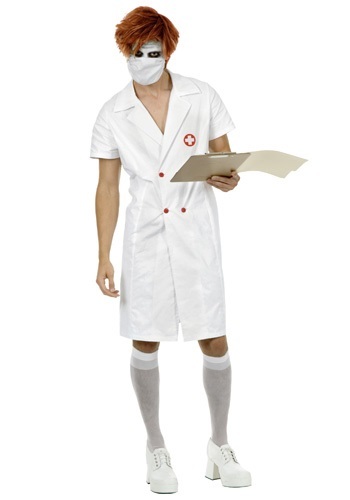 That’s why we offer this Twisted Nurse Costume, which is a simple but effective way of letting people know that you’re here to help, but you have trouble knowing exactly what that means. Does paying a special visit to a VIP patient count? Could it involve turning a blind eye to the city’s corruption, or ignoring the petulance and hypocrisy of public opinion? Is that even a relevant question? Only you seem to have the answers! This dress makes a simple but effective basis for a screen-ready costume inspired by a complicated villain with a wicked sense of humor. Its clean white, festooned with some cheerful red buttons and a cross insignia, should create a perfectly chilling contrast with your hideous scars and smudged makeup! Add a surgical mask and some knee-high stockings if you really want to give people even more to think about. Sometimes all it takes to cure whatever ails you is to shake things up a little!